Anyone familiar with Shufang’s work will know she loves to deal with notions of food and it’s production in her art making. Instead of decking the given niche with real food, she has gone to another layer and conceptualism, linking food and art, possibly a strategy of making contemporary art more palatable. This particular installation replaces a site-specific wall drawing by Tang Ling Nah. 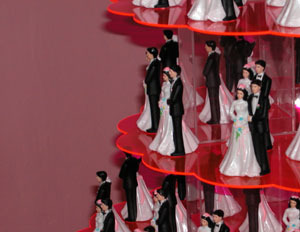 A symbol of matrimony, a physically multi-layered symbolic cake decoration lie at the heart of the installation. 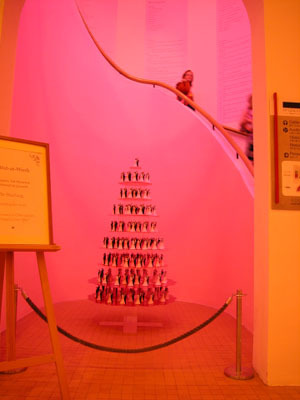 The staircase was adorned with large prints of instructions, or recipes for a happy marriage. On closer inspection, you will find cake decoration toppings (see picture above), with Caucasian features neatly arranged, each pair facing outwards. It almost seems to represent that this is the most important part of any wedding cake, the symbol of a happy marriage, but multiplied profusely here, in a true ‘uniquely’ Singaporean ‘kiasu’ manner. If each decoration piece was a blessing, the message of wishing for a blissful marriage becomes clear, if not excessive. There is something sinister about this, because most wedding dinner’s I had attended, except for a classmate Angela Oon’s, the layers of cake are fake, and the entire cake-cutting gesture purely symbolic. The cake isn’t really a cake, but moulded plastic masquerading as glorious, rich cream. Perhaps the kitsch here suggests the opulence of wedding dinners’ symbolic gestures gone awry, meanings diluted. Audiences who are single will have to agree with me, each wedding dinner they attend with relatives, is a reminder of their single-hood bombarded with the question, when are they getting hitched. This installation thus represented two perspectives: for those getting married or are married, it is a promise that should be made, maintained repetitively; for those unmarried, each wedding dinner is possibly as repetitive and dreary as all others, meaning lost in purgatory eating. What didn’t work for me in the installation is the awful flush of pink light. 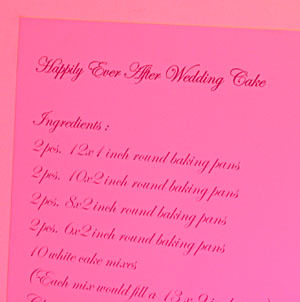 The font chosen for the recipes were too difficult to read, especially if the text was integral to the work. This perhaps shows you can’t have your cake and eat it too, sacrificing another layered of understanding of the work, for pink abundance kitsch. This is a pretty, straight forward exhibition that will intrigue artists and audiences alike, comparing the stylistic differences across a range of traditional fine art media in the depiction body, portrait, and of identities. The media include woodcut prints, Chinese traditional inks on paper, watercolours, and oils on canvases. What is intriguing is perhaps the dfferences of ‘representation’ of the human form – direct, abstract, direct-anonymous (where the identity of the sitter is of little concern), abstract-anonymous – and the technical competency of these works. For example, Nelson Calderon’s “Sin Titulo”, best described as ‘abstract anonymous’, marbling application of acrylic paint in a surreal landscape with rock-like nudes are a little kitsch but enjoying to look at. Chua Say Hua’s “Happiness with Joy”, a cubist-like rendering of 2 figures, or possible a confused person, could also be described as ‘abstract anonymous’. I think the interest and intention of the artist was in the fragmentation of the picture plane, more than recording any ‘real’ scene. The confusion here, is perhaps the interest point of the work. The advantages of recording a real scene, can perhaps be seen in the watercolour portrait of the pregnant wife Tay Chee Toh (I hope I got the artist’s name remembered correctly). It radiates because it heightens our memory of how such a scene will look like, more than what a straight photograph or confusing painting or paintings that need a look of work to decipher can offer. The strokes in the traditional ink portraits contain a certain life-force, an aggregation of calligraphy and mild action-painting. The other direct paintings in the show, nudes are contemplative rather than shocking, though a younger audience may still squirm a little. The arrangement of the works are considered by subject matter and media. What is most disturbing to me is, the empty white wall that faces the door leading to the streets. The second most disturbing thing, is the dodgy poor lighting, my mother with poor eye sight will complain of. This exhibition is not like unveiling Picasso’s “Les Demoiselles d’Avignon “(1907). Scandalous and subsequently revolutionary. It is really a brief survey into the fragmentation of representation, the fragmentation of life as we view it, in pace with modernity. What will be a good follow-up, will be a contemporary rendition of ‘style and imagnation’ in the shelters of art, in the arena of contemporary photography, video, and installation. It is perhaps in this shelter, we can take stock of what means most to artists, and how they see and represent our collective contemporary lives. This is an exhibition about seminar works from the Seventies, representing a clash of ideologies of artists, with new found knowledge from the West either by being there or from other means of communication, and their acceptance of ‘new media’ challenging batik painting, handicraft and status quo of the traditional arts. The curators have spent a lot of effort in the logical placement of works, siting relevant works by nationality near each other. The walls and display cabinets for ‘deconstructed’ book-form-but-laid-out-to-dry-text are very well built, and does surprisingly change the space, positively. The black wall that starts the exhibition is clueless, unfriendly, and hugely over amibitious to track trends and influences in Southeast Asia. It falls flat on it’s face, metaphorically, and one wonders what is omitted. For example, in 1965, the independence of Singapore is not mentioned. The title is actually very apt, but easily construed as ‘clueless’, mis-leading, or at best mis-read. The title, I think, tries to convince ‘A truth is out now’. Our Modernism, as we possibly can understand it, existed because of a Western written, theorised, published, re-published, written-to-near-death Modernism. And all the accolades have been awarded by Western art curators and critics, because English is one of the ligua franca of the art world. Today, We the Post-65 generation, have all assumed that the West came, everybody suddenly wanted to make art and We (art smugs?) call it post-modernism as quickly as we can, because of post-colonialism, because of post-world war 2. But because we never read anything sensible from artists living in that time. Curators from SAM, have been more keen to publish thematic, and summative, all applauding publications of Southeast Asian Art, omitting artists’ voices. I’m refering to the likes of Imaging Selves. 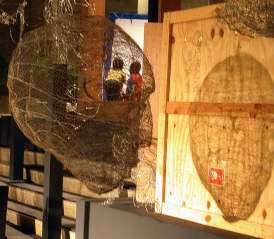 Few has directly acknowledged the influence of Southeast Asian artists, on their counterparts in their respective countries. Were these documented by artists? The text, is all important because it literally goes down in history. Did our modernist artists write well? The truth is out because they did write about their own art practices, and in its own subtle nuances, distinguished in its autonomous effort to make sense of our own art history. This exhibition will ‘suggest’ a favourable light, leaving me curious to think of other omissions. I’m a huge fan of Cheo Chai Hiang and Redza Piyadasa. I’m a fan of certain strands of art history, and I’m curious about the links between contemporary art practice today and the concept of Western Art Historical Hegemony. This exihibition was just right for me, but on the dull side for those unappreciative of the concept of art development. Telah Terbit is a reminder of such, a good contrast to the hip Singapore Biennale, if only more saw it in this light. Victor Tan, local visual artist, has been around, accepting commissions for corporate and private in the past 10 years. This recent display could perhaps be seen as a tour de force, rendering near perfection of the man’s torso form and an explosion in numbers, each with a lightness of touch – the mesh of wires under Victor’s careful hands seem to float and deny gravity. This is a bold expansion of Victor’s understanding of the wire-material, eclipsing his previous collective exhibition of works. Victor’s work seems to be striving towards the ideal from idea to execution, literally taking shape from mangled wire. His works are simple yet elegant, imposing yet familiar. The installation comes across like a dreamscape, with hovering babies/cherubs, floating heads and bodies in conversation. The body, people-relationships are central to Victor’s work. Indeed, the body and it’s idealized form has seen representation in the Greek sculpture of the gods and goddesses, perfection of marble sculpting in the Renaissance, most notably Michelangelo Buonarroti’s David (c.1500-1504); embellishment in the following Baroque period through the works the likes of Bernini’s Ecstasy of St. Theresa (c. 1647-1652); Anthony Gormley’s body casts of Learning to Think (1991). 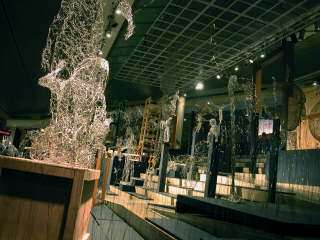 The anti-thesis to an Ideal forming the 20th Century, can perhaps be seen in Gilbert and Georges’ performative Singing Sculptures (1970), Kiki Smith’s dissected Man (1988), British artist Marc Quinn’s 12 foot Naked Disabled Woman Sculpture (2005). I think I will be right to say that Victor’s work can be appreciated by touch and visual sight, as I can imagine a series of one-lined drawings popping out of the paper, and walking into our three dimensional world. The order, within the chaotic twine of wires escapes the progression of point-to-line, line-to-shape, shape-to-form. Instead, Victor offers us the possibility of skipping steps, from line-to-form, from dream to reality. Till Jan 7 ,2007, Esplanade Concourse Steps.